Chuck Berry has passed away at the age of 90, Missouri police reported. The rock and roll legend was found unresponsive at lunchtime on March 18, St Charles County Police Department said. Chuck Berry‘s seven-decade career boasted a string of hits, including classics Roll Over Beethoven and Johnny B. Goode. The singer received a lifetime achievement Grammy in 1984 and was among the first inductees to the Rock and Roll Hall of Fame in 1986. The St Charles County PD said in a Facebook post that they were called to reports of an unresponsive man at 12:40 local time. “Unfortunately, the 90-year-old man could not be revived and was pronounced deceased at 1:26pm,” the statement said. High-profile musicians were quick to pay tribute to Chuck Berry’s talent and influence. “I am playing I’m talking about you,” the Beatles drummer wrote. The Beatles and the Rolling Stones covered Chuck Berry’s songs, as did The Beach Boys and scores of other acts – including Elvis Presley. 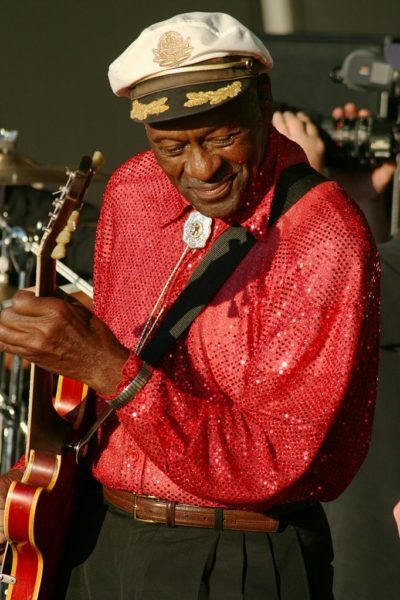 Mick Jagger said that Chuck Berry “lit up our teenage years and blew life into our dreams”. Chuck Berry was born in St Louis, Missouri, in 1926, and had his first hit, Maybellene, in 1955. In 2016, Chuck Berry announced he would be releasing his first album in nearly four decades. He dedicated the album to his wife of 68 years, Themetta “Toddy”.